You must leap in fancy, leagues and leagues over strange lands and stran­ger seas, into the proper territory of that marvel-maker Kipling, whose tales and verse you love so well. You must set your steps straight on the road from Man­dalay and keep a staunch stride until you find yourself in the heart of Rangoon. Here halt, and gaze in reverential awe upon the Golden Pagoda. The Buddhist shrine means little to your first glance, as St. Peter's at Rome would mean little to a servant of Buddha. Try to feel that in the Golden Pagoda you are considering the St. Peter's of the faithful worshipper of Buddha. Not many paces to one side a pavilion of rich and curious architecture lifts itself slowly toward the sky. In the sun the gold crest of the pavilion shines dazzlingly and with its brilliant flare gives a wel­come to the far-off ships bearing down the river Irrawaddy. On the ship's deck are strangers bound to visit this rare domain. 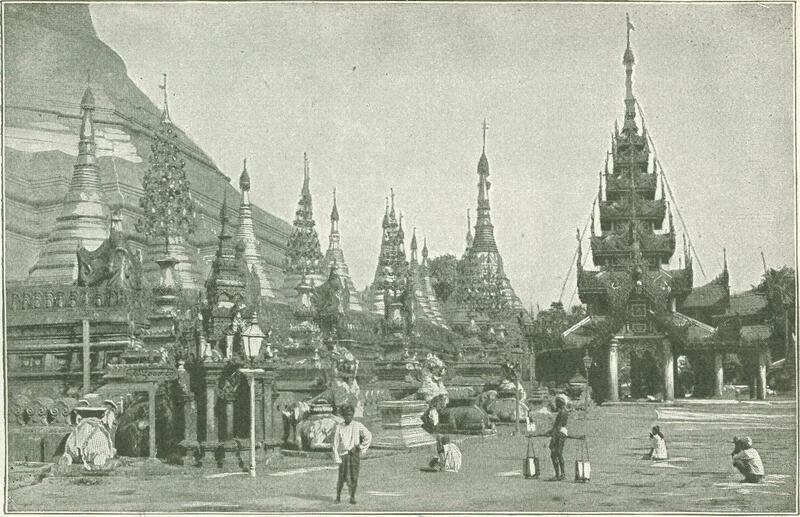 Inside this gorgeous pavilion is hung the big bell of Burma, the biggest bell, doubtless, in all the broad world. From top to bottom and all around the exterior surface the bell is graven with signs and letters of the people. Inside the dome ten of the tallest and stoutest giants of a football eleven may stand comfortably and with full breathing space. The tallest of these, and he of most extensive, reach, may stretch forth his right arm till his muscles twinge and the blood in his finger-tips prick his skin, and he will barely touch the sharp rim of the big bell. There is no clapper to the bell. From the outside swings a tremendous bronze beam, falling with rhythmic beat on the heart of the bell and sending forth shuddering a message of faith to just and unjust, to pious and impious. For many miles the melody vibrates on the clear air. No bell is so rare in sound, none so rich in memory; and each succes­sive tone stirs the store of recollection in the minds of the worshipful. 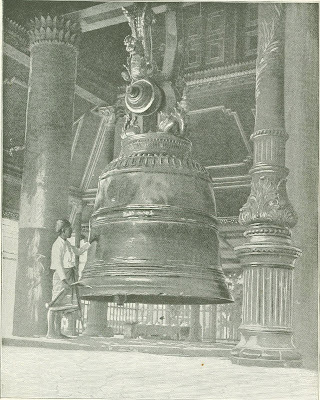 The most tender remembrance awak­ened by the ringing of the big bell of Burma is concerned with the very cast­ing of the venerated instrument. The bell was cast so many ages ago that the people have almost lost count of the years. Thus they say simply, "thousands upon thousands of years in the time of yester­day was made the holy bell." All the world for many leagues roundabout hast­ened to be near upon this momentous day of festival and of prayer. The rich and the poor, the merchant and the soldier, the mother, the wife, and even the chil­dren were present. The latter in years to come were to narrate to their grand­sons and daughters with righteous pride the ceremonies and wonderful performances which came to pass when the great bell was made. Years in advance the priests, the government and the peo­ple had laid ample preparations for this occasion. Money and metals had been col­lected. Soon the vast cauldron was set in place, and the great flames, which darted up and around the sides of the vessel like writhing serpents, had been ignited from sacred fire. There was much prayer, much fasting, much meditation and exhortation. Then amid the chanting and cries to the good god Buddha, the metals were flung into the cauldron to be smelted. The hissing of the flames, the smoke, the heat of the molten metal, the singing of the Brahmins which had now risen to a very hysteria, all united, set the people in a frenzy of religious enthusiasm. A veteran warrior, lusty in his day and therefore the more penitential now, wrenched his sword from the jeweled scabbard and flung the glit­tering sheath into the smoking cauldron. For a moment his neighbors gazed in amazement. Then the merchants, who had come hither attired in richest raiment and most precious jewels, of a sudden were seized by the fervid example of the warrior. One after another they tore off bracelets, girdle and rings and hurled them in fiery devotion into the cauldron. Their wives, in raiment and jewels still more costly, made haste to imitate their pious mates. The poor cast their humble mite of coin and tawdry ornament, those promised in marriage their mementoes of betrothal and heart-warmed trinkets of love. Quick upon these followed the chil­dren, and surely Buddha must have val­ued this oblation above all others. The little ones whirled into exaltation they could neither understand nor control, pitched with what aim they could, their much prized toys of metal, doll-goddesses, toy-swords, all that their clinging hearts had held so jealously. Such infant offer­ings as went wide of the mark were gath­ered scrupulously by the bold and re­pentant warrior, whose stout arm sent them unerringly towards the making of the holy bell. Now, if one were to endeavor to put a price upon the big bell of Burma, which is beyond all price, a shrewd judge, being informed of the quantity and kinds of metal of which it is composed, might say that it is worth $100,000 in the coin of our land. This means $300,000 in the money value of the faithful Buddhists. Not all the wealth of the world, however, could persuade them to part with the ven­erated bell, insomuch as it is under the manifest tutelage of Buddha. The people tell a most remarkable instance of this providence, which in the histories of the British, who do not believe, is set down as a mere accident. 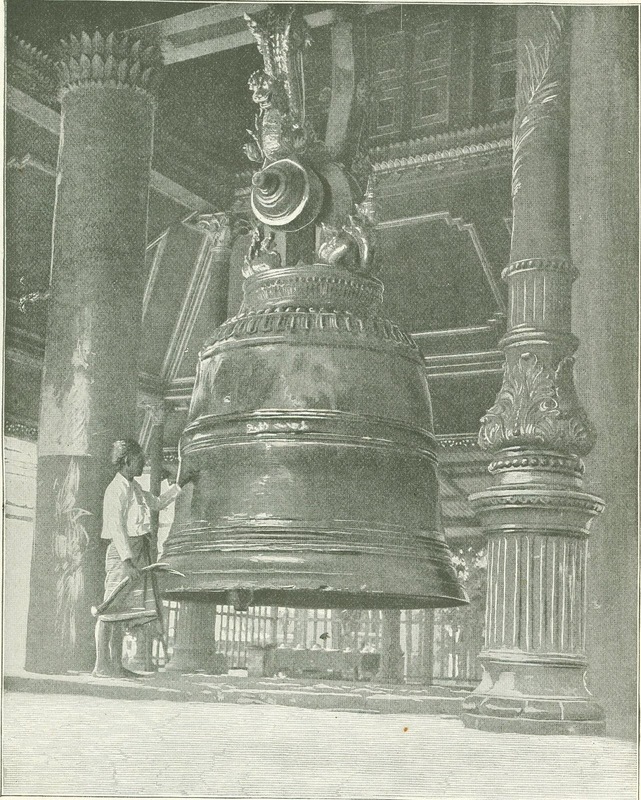 When the terrible men of fight, who wear dazzling coats of scarlet, invaded and captured Burma, in the unhappy year of 1824, they strove to take posses­sion of the bell, that they might steal it away to their far-distant home. Toward this end they harnessed long lines of ele­phants and oxen, and, by some witchcraft of mechanics, the invaders laid the bell on a great wagon. They drove it down to the shores of the Irrawaddy. The bell was then laden aboard a vast ship, and the marauders had just hoisted, sail to be off with their sacrilegious booty; when the invisible hand of Buddha intervened. Im­pelled by this secret force the big bell of Burma glided off the deck and sank deep into the muddy bed of the river. The in­vaders were so awed by this mysterious manifestation of power that they made no further attempt to secure the bell. Long after the natives recovered it, only through the exertion of superhuman effort, and restored it to the sacred pavilion in triumphant homage. The number of pious pilgrims who an­nually journey to the Golden Pagoda, to make offerings of jewels, flowers and flags, is to be reckoned only by the num­ber of people who inhabit the whole wide land. First, the pilgrims prostrate them­selves before the big bell. After some time of meditation they feel themselves worthy to enter the glorious Golden Pa­goda. The pagoda stands on a mound surrounded by a moat and is reached by peculiar drawbridges. The base is 1,350 feet square, and the umbrella shaped pin­nacle rises to the height of 375 feet. 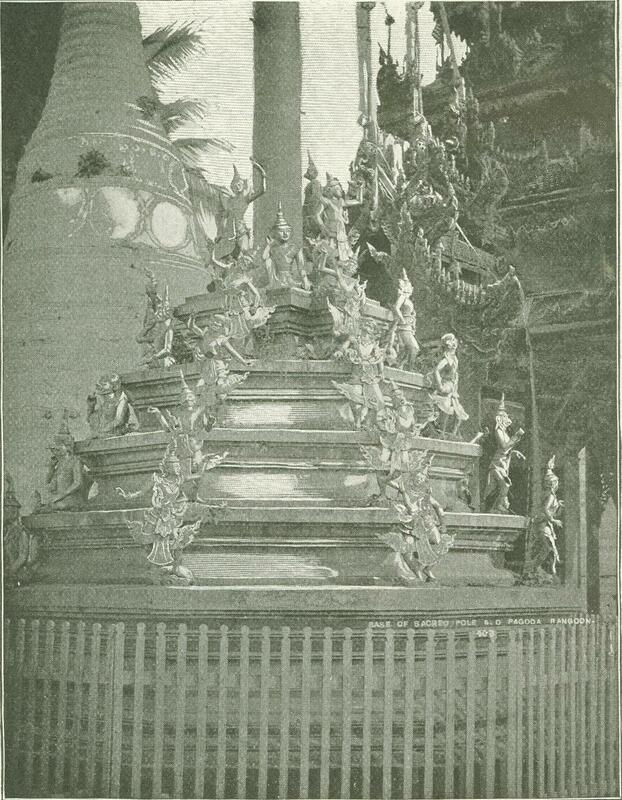 The material of which the pagoda is built cost $250,000. The labor cost nothing, as the services of the priests and devotees were given gratuitously. There are four great stairways leading to the platform, and there are four cardinal points at which are shrines and temples, as seen in the accompanying pictures. All about the platform are innumerable smaller shrines, miniature temples, bell-shaped and with spire surmounted with little umbrellas, like the main edifice. These little shrines are marvels of carved woodwork and red lacquer. They have tapering roofs one above the other, till they, too, end in a golden spire full of little bells with tongues that voice out delicious tinkling music when disturbed by the soft breezes. The tones are faint, but clear and distinct, — "the silver stir of strings in hollow shells." 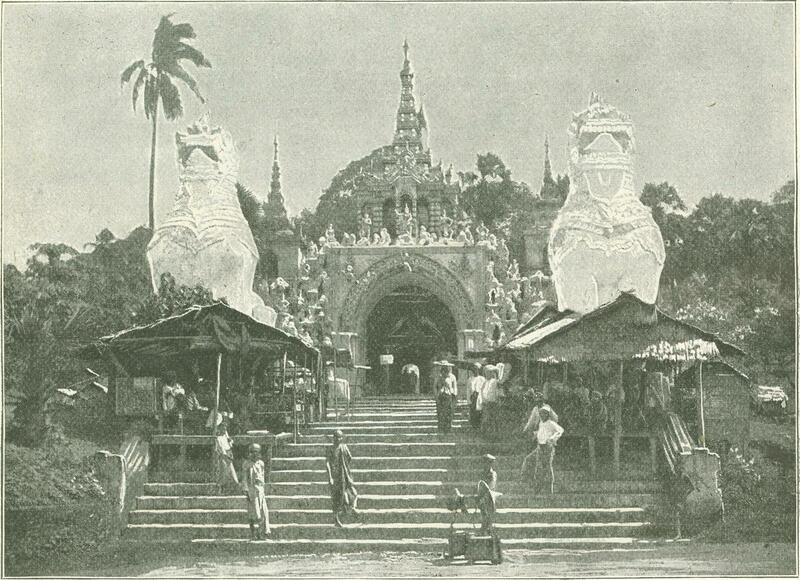 The entrances to the pagoda are guarded by white stone images of dogs, elephants and griffins. Some of these are fully sixty feet in height, and horrible in their ugli­ness to the eye of a foreigner. The ap­proaches to the entrances, through long, narrow passages, are also guarded by grif­fins of stone, wood and plaster. The high walls of these passages are hung with the designs of native artists, symbolizing the awful punishments to be administered in the hereafter to those who have not walked the righteous path of Buddhism. 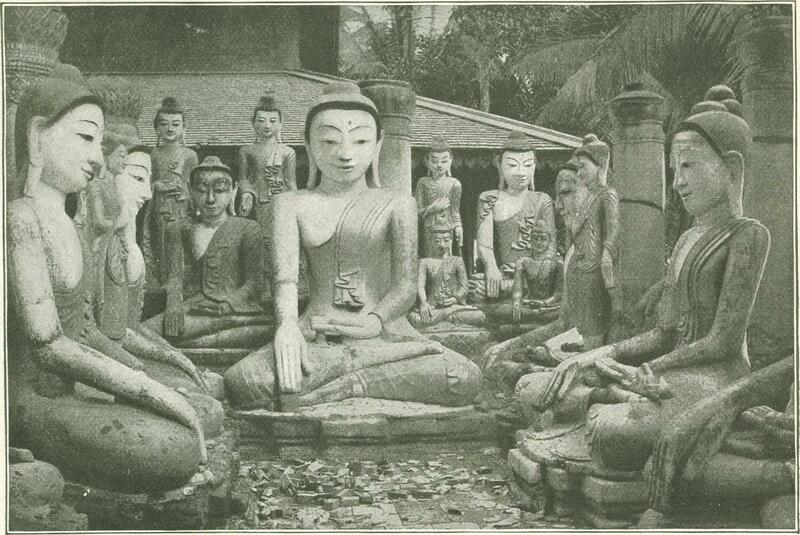 Battered about the lesser shrines are colossal statues of the fourth and, the last of the Buddhas, Gautama. These images are graven in stone, in brass, in ala­baster, and in wood. As they appear to the foreign eye, no attempt has been made to arrange them. They seem to have been dumped down wherever there was room for them. A peculiarity of these giant statues is that each has enormous hands and long, stiff fingers. 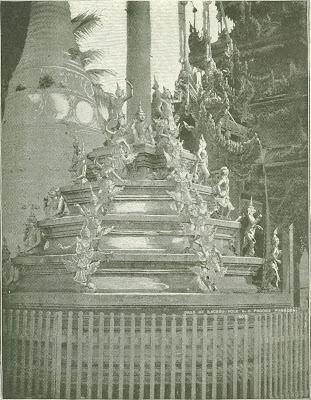 Now, the reason for the eminent ven­eration of the Golden Pagoda lies in the wonderful treasures of sanctity which are buried under the floor of its inmost shrine. These are the relics of the four Buddhas who - have manifested themselves to man during the present Buddhaggabba. Here are gathered the Staff of Kokoothanda; the Water-dipper of Konaggama; the Bathing-robe of Kathaba, and eight hairs from the head of Gautama.